Clem Chambers is confident that an influx of Chinese money into the market caused the recent Bitcoin price rally. The ADVFN CEO believes that the present economic tussle between the United States and China will cause the top-ranked cryptocurrency to become the safest bet for wealthy investors to hedge any fallout from the trade war. 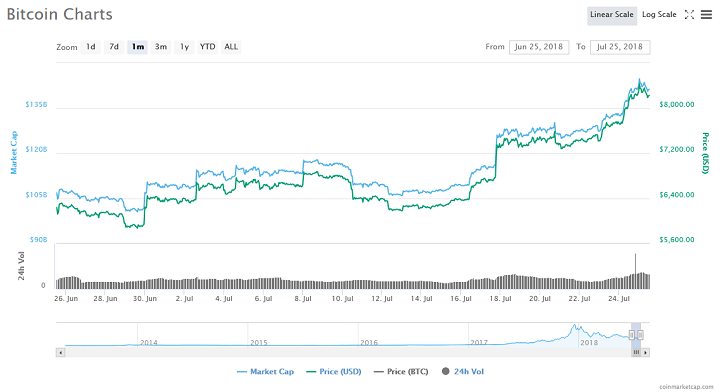 According to Chambers the explanations offered thus far by analysts and experts to explain the current BTC price trend aren’t accurate. The ADVFN chief doesn’t agree with the notions that short squeeze, sudden fear of missing out (FOMO) syndrome or any of the other reasons flying around the news are the real triggers for the price push. However, what caused the sudden unexplained spike is now clear to me. It is [the] Chinese devaluation, the insider reaction to imminent, planned, significant and perhaps rolling Chinese currency devaluation that set off this rally. It was a group of insiders buying bitcoin for Chinese yuan before the devaluation that took place two days later struck. This devaluation process has been going on for weeks, but it accelerated last week. Frantic dumping of Chinese fiat currency in the wake of reports of an impending currency devaluation flooded the Bitcoin market with a ton of buy orders. Predictably, the market responded to the increased demand by skyrocketing. Many of these wealthy Chinese probably didn’t care if they were paying a premium for Bitcoin as long as they could hedge their wealth against the coming currency devaluation. With the current standoff between the United States and China and the latter’s decision to devalue its currency, Chambers expects BTC to become the de facto haven for wealthy individuals. The ADVFN CEO believes Bitcoin is more convenient for people in comparison with gold. Based on Chambers’ analysis, it seems the current price rally will last for a little while unless a catastrophic market event like a high-profile hack occurs. Do you agree with Chambers’ reason for the BTC price surge? Let us know your thoughts in the comment section below.